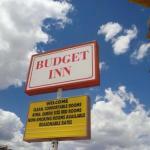 Budget Inn Las Vegas is located in Las Vegas New Mexico. Free WiFi access is available. Storrie Lake State Park is 10 minutesâ?? drive from the motel. Each room at Budget Inn Las Vegas provides a TV air conditioning and a seating area. Complete with a microwave the dining area also has a refrigerator and a dining table. Featuring a bath or shower private bathrooms also come with a hairdryer. Extras include bed linen and a fan. At Las Vegas Budget Inn an airport shuttle and a 24-hour front desk are available. An array of activities can be enjoyed on site or in the surroundings including golfing. The property offers free parking. Las Vegas Municipal Airport is 10 minutesâ?? drive from the motel. Las Vegas National Wildlife Refuge is 12.6 km from Budget Inn Las Vegas.